The new American Community Survey data indicates at least two significant narratives with respect to work access trends (commuting and working at home). One is transit work is becoming even more concentrated in only six of the nation’s 20,000 municipalities, the six transit legacy cities. The second is that working at home has passed transit in access to jobs, it now trails only driving alone and car pools. 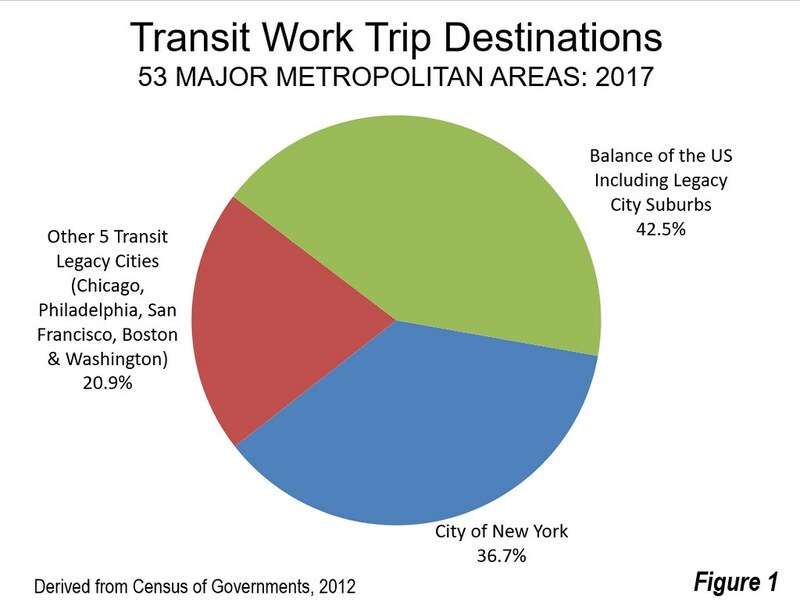 The new data shows that the extreme concentration of transit work trip destinations in the six “transit legacy cities” continues to intensify. The transit legacy cities are the municipalities of New York, Chicago, Philadelphia, San Francisco, Boston and Washington. These municipalities are not to be confused with the larger metropolitan areas. These municipalities represent from about 10% to 40% of the population in their respective metropolitan areas. In 2017, 57.5% of transit work trip destinations were within the city limits of the six municipalities (Figure 1). Large core cities, notably the older legacy cities, usually have many more jobs than resident workers, and many of them work in the downtowns. For example, in 2017 more than 1.5 million people had jobs in the city of Chicago, while the number of people living in Chicago with jobs was about 200,000 less, according to ACS. 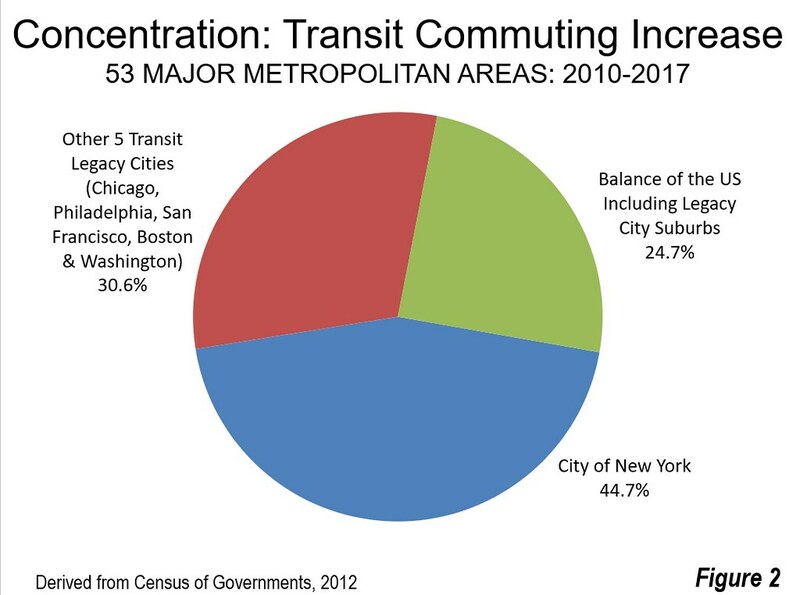 The concentration of commuting destinations in the transit legacy cities was nearly 10 times that of their employment share --- 6.1% of the national total. Within these municipalities, the transit destinations is even more concentrated in the six largest concentrated employment centers, all downtowns or central business districts that are housed in the transit legacy cities. Their transit destination market shares range from nearly 45% to more than 75%, well above the nationwide average of five percent. The average outside these six municipalities is a paltry 2.3%. The concentration is also indicated by comparing the share of transit commuting in 2010 and increase since that time (Figure 2). The city of New York, which by itself represents 37% of transit commuting destinations cornered 45% of the transit commuting increase since 2010. The other five legacy cities accounted for 21% in 2017, while capturing 31% of the growth. The balance of the nation falls far short, with 43% of transit destinations, while attracting only 25 percent of the increase since 2010. While there have been recent, pervasive declines in transit use around the United States, transit is still increasing its work trip ridership to legacy city destinations, principally their downtowns. This is not surprising, since each of the downtowns developed its present form before the auto became the dominant mode of transport. Overall, the transit legacy cities have experienced a seven percent increase in transit destination market share from 2010, when they had 53.8% of the transit work trip destinations. It has been predicted for some time that working at home would exceed transit commuting, as I did in a 2010 column on 2009 ACS data. It finally happened in 2017. 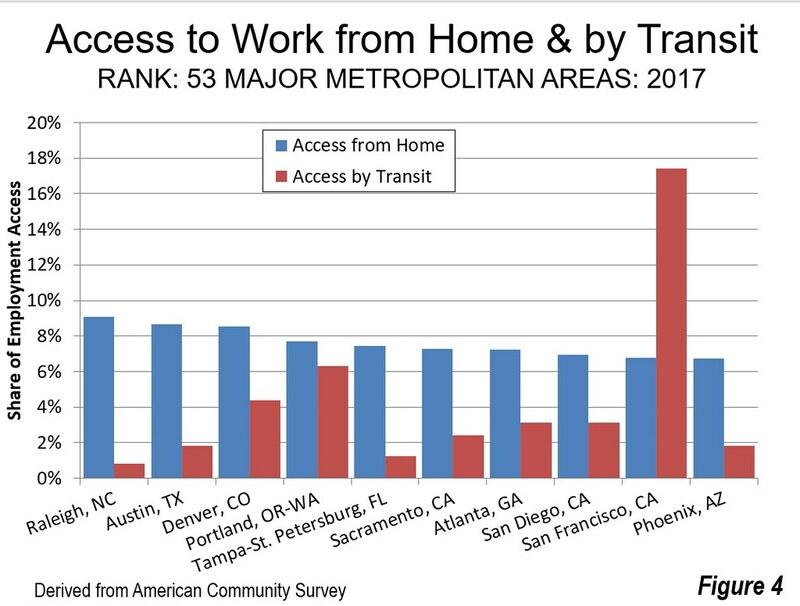 Now, working at home leads transit in work access in 43 of the nation’s 53 major metropolitan areas. The 10 in which transit leads working at home includes those with six transit legacy cities, Baltimore, Buffalo, Pittsburgh, and Seattle. Many fast growing areas, many with strong tech economies, dominate the list. This year, Raleigh leads the nation in work access from home, with a 9.1% share. Austin and Denver are at 8.7% and 8.5% respectively. 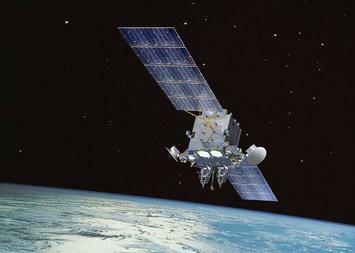 Portland is fourth, at 7.7%, while Tampa-St. Petersburg ranks fifth at 7.4%. 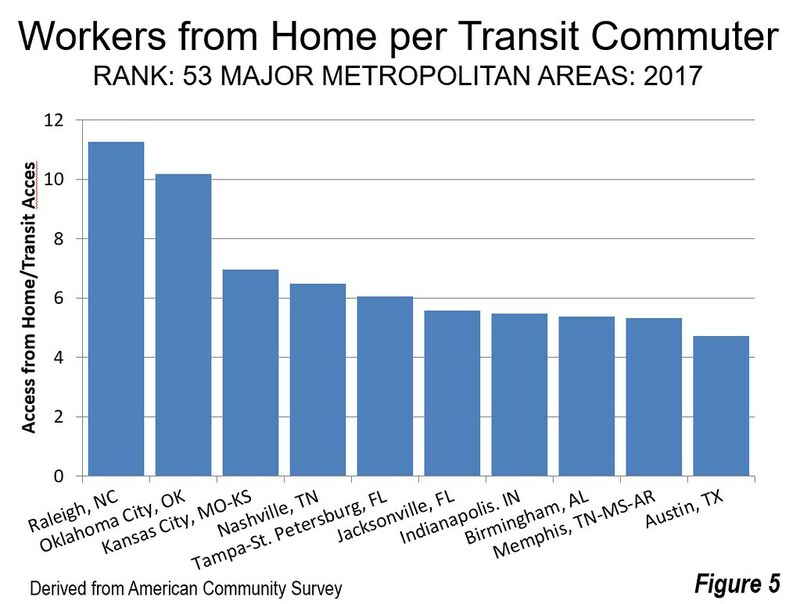 Among the top ten work at home metropolitan areas, all but two have at least nearly twice as great work access from home as by transit. San Francisco is the only metropolitan area with a transit legacy city in the top ten in working at home, ranked 9th (Figure 3). As Americans look to reduce travel times and energy use, it is clear other options --- such as home based work --- make a far more fertile target than the oft-repeated, and largely failed, attempt to get people on transit. American travel is being radically reshaped by new telecommunications technology, including ride hailing services and, in the future, autonomous vehicles. Transit has an important role to play in getting commuters in and out of the largest downtowns, but cannot compete with the car even in the closer in suburbs. It is time for urban transportation policy to leave the 19th century behind. At the same time, working at home, which requires no subsidies, is likely to continue to increase not because of government preferences, but rather because the market is increasingly demanding it. These two trends that are well underway seem likely to continue. Transit is likely to see its dominance concentrate in just a few downtown areas and stagnate outside, from the suburbs just miles away to the rest of the nation. At the same time, working at home, which requires no subsidies, is likely to continue to increase not because of any government programs, but rather because that’s a better solution for millions of workers, and even employers.